On some level, I’m sure I knew. But just this week it became clear to me that I have been depressed—likely my whole life. It wasn’t a deep depression, but I struggled almost daily with a low-grade sadness, a desire to hit snooze and pull the covers over my head. But I fought it by dragging myself out of bed and onto my yoga mat for so many years, just to make it through the day. Hand in hand with this revelation is the fact that I recently started to face the trauma of my birth story. My mother was in labour for 48 hours with me because no one knew I was breech until it was too late. Finally, the doctors pulled me out with forceps. According to my mom, I cried for six months and nothing she tried could console me. I didn’t realize you don’t have to be assaulted or violated to be traumatized. Why was a part of me always sad? Why did I struggle so hard with negative thoughts? Why did I feel like I was always on the verge of falling into a black hole? I always had to work hard to feel good. So I did yoga, meditation, affirmations, read every book on healing and tried every healing modality from reiki to theta healing to everything in between. But deep down I was still sad. Until this week, when something miraculous happened to finally pull me out of my depression. I can’t believe it’s taken me this long – over four decades – to figure it out! And the answer? I found it in this amazing book by Julia Ross. First I took an assessment that helped me realize I have a serotonin deficiency. Did you know that repetitive negative thoughts and feeling ‘not good enough’ are related to a lack of serotonin? Through the other three assessments in the book, I recognized that my endorphins were also low – a giveaway is “being too sensitive.” My dopamine was on the low side too, making waking up especially hard. Now that I’m becoming a Psychotherapist I’m fascinated by brain chemistry and how it relates to our moods! So I started following the supplement plan (they’re actually amino acids) that Dr. Julia outlines in her book. After a few short days I’m amazed by the results. Now when a negative thought crosses my mind, I can easily let it go. No struggle. No falling down the black hole. And I feel happy. That sadness that I have carried around nearly all my life, honestly I can’t feel it, even when I try. It literally feels like a miracle. Of course, that doesn’t mean I’m going to stop meditating or going to therapy or doing my personal practice. It just means everything is so much easier now. 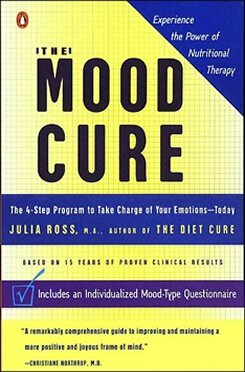 If you suspect you’re struggling with depression, anxiety or stress burnout, check out the Mood Cure by Julia Ross. I can honestly say this book has changed my life! Btw if you buy the book from one of the links above, I’ll get a small gift from Amazon for sharing the love with you. Here’s to happier moods for us all! P.s. Can you relate to what I’ve shared? Are you struggling with anxiety, depression and negative thoughts? Let me know your story on our Yoga Goddess Support Circle – I would love to hear from you!